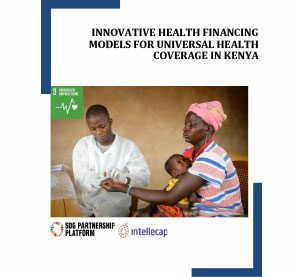 The whitepaper brings out the need for innovative health financing models in Kenya and how these models can work towards achievement of Universal Health Coverage. It highlights that broader approach to look beyond social impact bonds and how models like Advance Market Commitments, Asset Lease Financing can facilitate better delivery of primary healthcare services in Kenya. The white paper highlights that the Government should continue to significantly increase its budgets for health to deliver on the Country’s ambition to realize UHC, while it is tapping into other sources of financing to optimize the existing resources and bridge critical gaps.